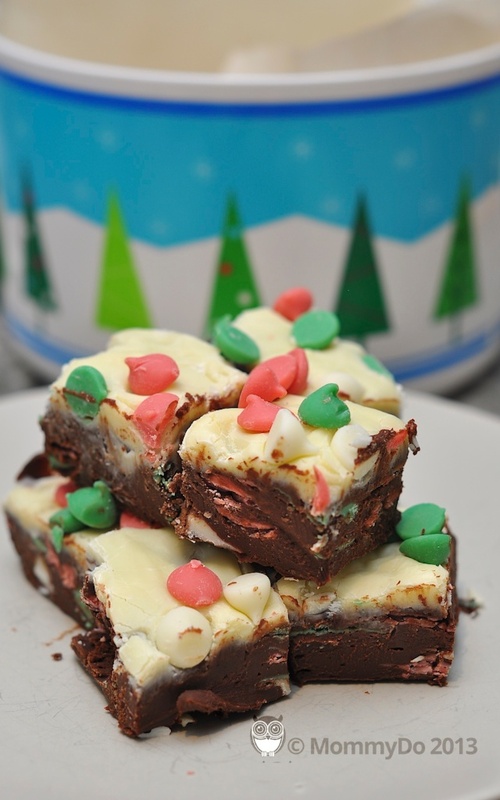 Shhh, this is ‘my’ secret fudge recipe. The biggest secret is how little time it takes to make something this delicious. Confession: Though I usually make this with walnuts as per the directions, this year, in an effort to make more ‘nut-free’ goodies, I swapped the walnuts for Chippits Holiday Chips. Pretty good! And very festive. LINE 8-inch square pan with foil, with ends of foil extending over sides; grease foil. Microwave semi-sweet chocolate and 2/3 can condensed milk in medium microwaveable bowl on MEDIUM for 2 min., stirring after 1 min. Stir until chocolate is completely melted and mixture is well blended. Add nuts (or festive chips); mix well. Pour into prepared pan. Refrigerate while preparing the top layer. REFRIGERATE 1 hour or until firm. Cut into squares to serve.